The Lookout Fire Company is pleased to announce that our social hall is now available for your baby or bridal showers, birthday parties, anniversary parties, engagement parties, training seminars, meetings, and any other gatherings for your organization, club, team or family desires. Our hall can accommodate up to 75 people with tables and chairs. With a full kitchen, you will have access to stove tops, ovens, microwave and refrigerator. The hall is completely air conditioned and has handicap accessible entrances and bathrooms, which is why it is the perfect place to hold your gathering. Please be advised that there is only Street Parking. responding to Emergency Calls Only. 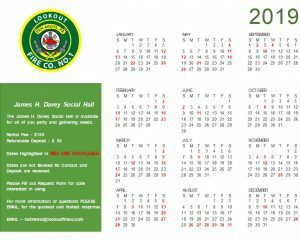 For more information and available dates please check the calendar below and download our Hall Rental Contract here. Please tell us what day you are looking to rent our social hall. Please check calendar above for available dates.